Hepolite piston rings and PeP pistons. Homepage. This page: An advertising flyer from the 1960s promoting Hepolite rings and pistons for your engine. Anyone who regularly dismantles old car, motorcycle or lorry engines will unquestionably have come across the name Hepolite, a firm renowned for their piston rings. 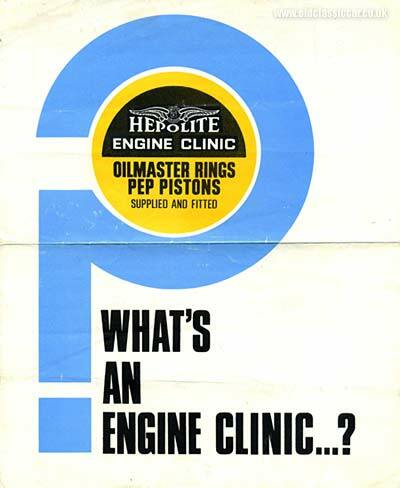 This leaflet, dating to 1967, advertises the Hepolite Engine Clinic service, one that garages up and down the land signed up for. Given that engines in the '60s usually needed at the very least a de-coke, and quite possibly a re-bore, after as little as 30,000 miles in many cases, re-conditioning old engines was big business. Any opportunity to save money when a motorist noticed that his car's engine had begun to smoke or go off tune, and therefore needed surgery, would no doubt be of interest. The Hepolite Engine Clinic would, so long as the engine wasn't too badly worn, be of great use, especially when the car in question was getting on a bit, and probably not worth shelling out for a new engine on. No doubt many high-mileage Cortinas, Victors, Oxfords and Anglias, hammered up and down the glistening new motorways by white-knuckle sales reps, had their lives eked out further by this service. "An Engine Clinic is a place that will nurse your engine back to life and save you a great deal of money into the bargain. Are you mis-led into believing that loss of engine efficiency can only be overcome by fitting an expensive reconditioned unit? This is not so. Modern engines have a long life, but there inevitably comes a time when oil and fuel economy and general performance begin to suffer. A set of PeP pistons will restore a part worn engine to efficiency at a fraction of the cost of an exchange engine. This is real sensible economy which will give you a further 30,000 miles or so of excellent motoring. Any Hepolite Engine Clinic - and there is bound to be one in your area - will give advice and guidance freely. These clinics have been appointed by Hepolite because of their special skills and high standards of service. You can rely on them absolutely. They will either undertake themselves whatever work is necessary to restore your engine to peak performance, or else provide the Hepolite components - together with an instruction booklet - so that you can do the job yourself. Call in and talk to them - it may save you pounds." The Hepolite brand was part of Hepworth and Grandage Limited of Bradford at this time. In addition to pistons and rings, they could also supply cylinder liners and piston pins, and was one of the world's largest manufacturers and suppliers of these parts. The firm was founded in 1907 and moved to Bradford in 1916. At the height of their success, they were churning out some 1 million+ piston rings per week from the St John's Works, an area of 90,000 square feet accomodating over 500 production machines. In the 1960s production of piston rings moved to Sunderland, continuing until the 1990s. More period items relating to old vehicles can be found in the Motoring Collectibles section of oldclassiccar.co.uk. A desk blotter issued by another well-known brand of piston ring can be found on the Brico page, again in this section.